Benzodiazepines are useful in treating conditions such as epilepsy, status epilepticus, anxiety, cerebral palsy, muscle strains, muscle spasm and panic disorders. There are three different groups of benzodiazepines. These are based on the duration of action. 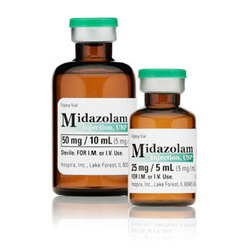 The short acting benzodiazepines include midazolam ( also useful as anesthetics), the intermediate acting benzodiazepines such as alprazolam, lorazepam and temazepam and the long acting benzodiazepines such as flurazepam and diazepam. Benzodiazepine typically bind to the GABAA receptor which lead to activation of the GABAA receptor. This will lead to further increase in the flow of chloride ion through the chloride channel which cause hyperpolarization of the cell membrane. Finally there will be decrease in the neuronal activity in the thalamic, limbic and hypothalamic region of central nervous system. Benzodiazepine should be avoided in patient who currently taking barbiturates, alcohol and patient who suffer from liver disease. Benzodiazepine overdose may be treated with flumazenil. Flumazenil is a competitive antagonist of benzodiazepine at the GABAA receptor. Overdose of benzodiazepines may lead to respiratory depression and collapse of the circulatory system. The common side effects of benzodiazepines are ataxia, sedation and altered in mental status. It is not advisable to stop the benzodiazepines abruptly as it may lead to withdrawal symptoms such as anxiety, confusion and insomnia. Patient becomes dependent to benzodiazepines.